Old hand painted Bollywood poster of the classic Hindi film, CID (1990) for sale. This is an actual surviving Bollywood poster of the 1990 film that featured Vinod Khanna, Kiran Kumar, Amrita Singh and Juhi Chawla. Printed and circulated somewhere in the early 1990s, this old movie poster was printed for publicity of the film but never ended up being used. This old Bollywood poster was originally hand painted on canvas by a small time art studio in Kolkata, making it highly collectible. The design of this hand painted Bollywood poster features a striking portrait of actress Juhi Chawla in a glamorous pose. Vinod Khanna is seen holding a pistol in a quirky hand drawn avatar at the center. Smaller portraits of Amrita Singh and Kiran Kumar appear at the bottom. Interestingly, the typography in this poster appears in three different languages – English, Devanagari Hindi & Bengali. 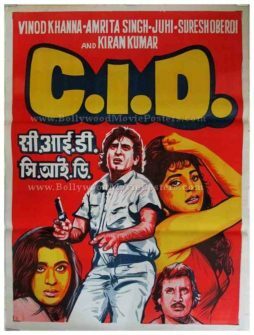 CID is a 1990 Bollywood movie starring Vinod Khanna, Kiran Kumar, Amrita Singh and Juhi Chawla in prominent roles. The movie revolves around the battle between a CID inspector (Vinod Khanna) and a feared drug lord (Kiran Kumar).